You are currently browsing the tag archive for the ‘Sabriel’ tag. Arthur was also counting on the promised intervention by ‘Will’, who he supposed was the same person or entity as ‘The Will’, that Mister Monday and Sneezer had talked about, who he presumed was also the giver of the Atlas. He figured that if he could get close to the House, it would do something to help him get inside. So I see from this book’s Author’s Note, that Garth Nix was born in Melbourne. I am of the opinion that many fine things can be found there and was pleasantly surprised by how much I enjoyed this book. The first in a series of novels called The Keys to the Kingdom, this is the second fantasy franchise by the gifted Nix. A few years ago I began to see copies of his Old Kingdom trilogy – Sabriel, Lirael and Abhorsen – everywhere in bookstores. Sadly I never tried them out (I was wary due to a glut of Harry Potter imitations at the time), but after I have finished this run, I reckon Mr Nix is going to become a fixture of my bookshelf. The book opens with an Inspector going about his duties inspecting the security of a very special item. Of course, this being a fantasy novel, the item in question is a paragraph from a very special Will. It is secured locked inside a crystal cage. Surrounded by a number of metal sentinels. On a dead star. The Inspector himself, is no ordinary bureaucrat, but a winged servant of a higher power who is partial to snuff. Shortly after his arrival the living aspect of the Will of creation manages to effect a jailbreak and escape to Earth, with Mister Monday’s determined lieutenants Dawn, Noon and Dusk hot on its trail. Meanwhile during Arthur Penhaligon’s first day at a new school, he collapses due to an asthma attack. 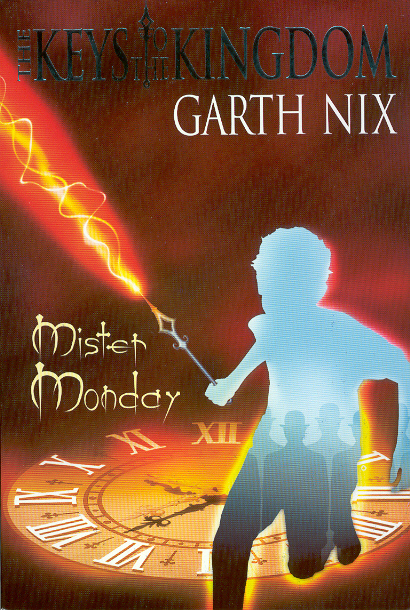 After he is revived by a girl named Leaf, he witnesses the arrival of the strange Mister Monday, who is tricked by the Will into giving the boy a mystical minute hand and a mysterious atlas. Arthur is expected to die soon, so it is hoped that his frail condition will allow the artifacts to revert back to Mister Monday shortly thereafter, neatly allowing the trustee of these objects to avoid any punishment for allowing the Will to escape. The minute hand is in fact a magic key that can effect the will of its user. The atlas can only be read by a bearer of the key and explains the nature of the House, a structure that represents each level of reality. The world Arthur knows is only the second plane of this structure, there are many others above and below, sitting atop the vast chthonic Nothing that spawns the mysterious creatures Mister Monday uses to control his realm. Arthur is surprised to find his asthmatic condition is relieved whenever he holds the key in his hand. Unfortunately Leaf’s family and a number of other children at school fall victim to a mysterious plague. Learning that the disease is being spread by agents of Mister Monday as they hunt for him, Arthur travels to the weird House that has appeared in his neighbourhood that only he can see. Inside he discovers a world of magic far bigger than the walls that contain it, filled with fallen angels, a talking frog, dog-faced men, dinosaurs and deadly Bibliophages. A world where words have power and little children enslaved by the legendary Piper have toiled for thousands of years. Determined to save the lives of his friends and defeat the corrupt Mister Monday, Arthur strives to find the secret of the Will. This is an entertaining first chapter in a series of novels for children. Nix drops references to ancient myths, religion and modern day paranoia about disease in order to give shape to his world. Arthur Penhaligon is an orphan whose biological parents died in a flu epidemic. At one point he travels in time to the period of the Bubonic plague. Death is a constant in his life and is used within the book to fuel the mythic fantasy Nix has constructed. While a Christian God is never explicitly named, the hierarchies of angels, from Seraphim down to Cherubs, resemble the mysterious figures Arthur meets. Nix also draws on Roman myth, as Monday and his servants resemble the quotidian minor gods of days and hours. I cannot wait to read Grim Tuesday.